My friend Ed told me about Champions Sports Bar a few weeks ago. He had heard some blurb about it on sports radio. My friend Luis was in town from Los Angeles, so my wife Marcela and I decided to take him with us to check the place out. Champions Sports Bar is located inside of the Marriott Hotel right by the Miami International Airport. We ordered the Champions Sampler Tower ( 2 Dozen Wings, 8 Beef and Cheddar Sliders, Fully Loaded Cheese Fries and Onion Rings). Luis seemed to like everything but in particular eating all the Cheese and Bacon off the fries, that mother f’er. Marcela liked the Cheese Fries the best as did I. It tasted like there was Parmesan Cheese on the Fries, pretty good addition if you ask me. The Wings and Onion Rings were pretty standard stuff as were the Sliders. The Sliders being average only meant one thing to me, that the regular Burger was either going to be Average or Really Bad. Luis orders the Miami Dog (foot long, half pound Hot Dog with Sauteed Onions, Chili, Mushrooms, Cheddar, Sauerkraut & Yellow Mustard), I order the Blue Cheese and Onions Burger and Marcela decided to quit while she’s ahead. 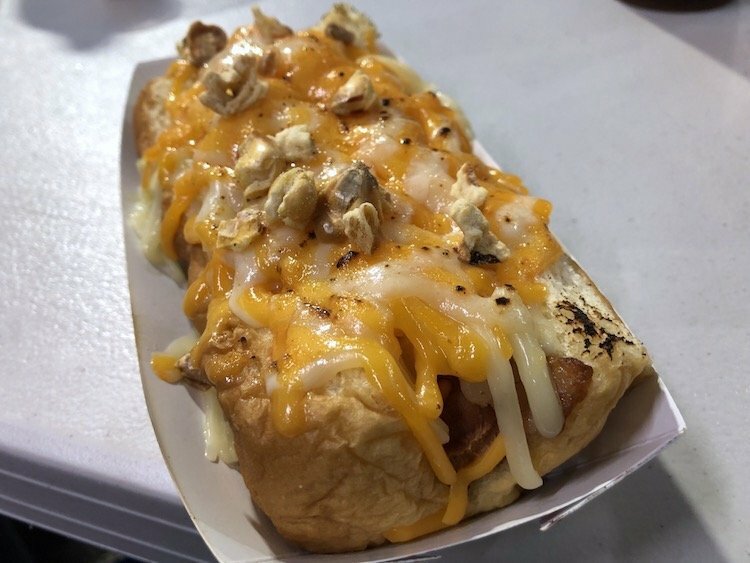 By far, the Miami Dog was way better than the Blue Cheese and Onion Burger. Not the best Dog I’ve ever tried as the server claimed, he must not get out much. Luis seemed to love the Chili which really irked me because I drove him to Arbetter’s to try the chili and he claimed this Chili was better. I really think he was pulling my chain on this one. The menu says “fresh Angus Burger” but I don’t buy it. It certainly did not taste that way, it was an average tasting Burger too. Plus I had spoken too soon, Marcela and Luis decide to order the Brownie Sundae. I’m not a Brownie fanatic but I can tell when something isn’t fresh. It was served room temperature with Hot Fudge and Vanilla Ice Cream. It was an average affair just like everything else which is a shame because the place seemed to have potential.